Is it okay to treat dead bodies as curiosities? I can't make up my mind. On a recent trip to Copenhagen, I ventured into the National Museum. A really good place to visit on a rainy day. I found the displays on the history of man fascinating. Denmark has a number of large bogs from which a substantial cache of ancient artifacts have been uncovered. However, there were two exhibits in particular that started me thinking. Both were females: a bog lady and a mermaid. The bog lady was a Egtved girl who had apparently died violently. 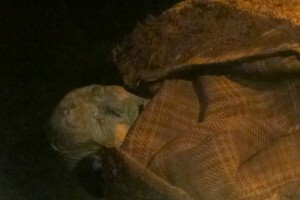 She is in a glass exhibit box, lying on her side and clothed in a woolen cloak. Her face still has flesh and you can see her features. Yes, they are wizened and monkey like, but definitely human. Is it ethical to display dead bodies in this manner? I definitely feel uneasy about viewing someone’s body. It’s like watching someone when they think they are alone. But I’m not sure if this is logical or just an emotional reaction. The bog lady started my feeling of unease – this wasn’t just a collection of bones, but a person with skin, and hair, and clothing. I felt like I was peering into a grave. Obviously the essential spirit of the person wasn’t there anymore, but it was a lot more personal than a skeleton. I don’t want people 3,000 years younger than me staring at my body. How do we know what this lady thinks about the situation? And then the mermaid skeleton. This was the partial bones of a female skeleton which had been manipulated with a shark’s tail fin to resemble a mermaid. If a museum is going to display a dead person, it is an accepted fact that the remains should always be displayed with dignity and respect. I was startled to see the skeleton of a mermaid, and slightly embarrassed to say that I double checked all the literature in the room to verify if it was real. It definitely gave me a jolt. I know mermaids don’t exist, so where did they find a skeleton? It was a while before I accepted the museum was playing a trick. This is not how we expect museums to behave, and yes, I think the idea was novel, and yes, it woke me up. But is it acceptable to play with the bones of someone’s ancestor? I’m not so sure. Then I started to do some research on the unburied dead. And discovered that there are some amazing places displaying dead bodies. Capuchin Catacombs in Palermo Sicily heads the list. There are over 8,000 mummies who were interred approximately 350 years ago. Now apparently these people wanted to be mummified and are dressed in their Sunday best ready for resurrection. But did they expect to be viewed by thousands of tourists? I suspect that if they knew this the queue to be mummified would have been even longer. The human quest for 5 minutes of fame is not necessarily new. If the person gave permission or authorized display of their remains, then it is totally different. I think it very weird to want to have your body on display, but if that’s what you want, then go ahead. Jeremy Bentham died in 1832 and requested in his will that he be preserved and displayed, and indeed to this day Jeremy is dead and well in a display case at the University College London. There should be consideration for religious beliefs. Perhaps they had no regard for their human remains, believing like Buddhists that there is no value in skin and bone once the spirit has departed. Or perhaps they believed in eternal damnation if their bones are not laid to rest. I did read that Danes think it is acceptable to display these bodies because they were not Christians. I find it hard to believe that anyone would hold such a view. What would you think if a relative of yours was on display in a glass case?